Slip and Sponge was a live participatory performance with clay. 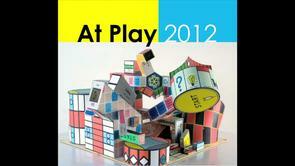 At the private view of At Play 2012, at South Hill Park, Bracknell. Slip and Sponge is perhaps an extreme version of what one might expect at a village fête. At the start I have a target painted on my chest and back which link with darts and archery. It is at the village fête or the freak show that people of all ages have sought an escape from the humdrum, while expecting to experience horrible pleasures and an affirmation of their own 'ideal' humanity.